In Jordan, the climate is usually subtropical arid, with quite cold winters due to the altitude, and sunny summers, which are hot but partly tempered by the altitude as well. In fact, most of Jordan is occupied by a plateau, which has an altitude between 700 and 1,200 meters (2,300 and 3,900 feet). The plateau is interrupted only in the west by the narrow valley of the Jordan River, which goes even below sea level and has higher temperatures, with mild winters and very hot summers. In the south, there are also mountains, culminating in Jabal Umm Dami, 1,854 meters (6,083 feet) high. In Jordan, rainfall is generally scarce, and occur from November to April, with a maximum in winter, between December and February. Total annual rainfall ranges between 250 and 450 millimeters (10 to 18 inches) in the north-western area, and it decreases to a desert level, below 100 mm (4 in) per year in the rest of the country, that is, in the south-central Jordan Valley, and in the vast areas of the north-east and the south-east, which are offshoots of the Syrian and Arabian deserts. Therefore, most of the country is desert, while the north-western area is semi-desert, and some parts of it, located above 1,000 meters (3,300 feet) are even quite green. From November to March, rains more intense than usual and concentrated in time can sometimes occur, and in these cases, the river beds, called wadis, which remain dry most of the year, can suddenly fill up and make it difficult to get around. Sometimes, Jordan can be affected by a strong and hot wind blowing from the Egyptian Desert, which brings dust and sand storms; this happens more easily in spring and autumn. In the Jordan's capital, Amman, the climate is overall mild and dry. The city is located at around 800 meters (2,600 feet) above sea level, and has an average temperature ranging from 8.5 °C (47 °F) in January to 26.5 °C (80 °F) in July and August. During winter, there are sunny periods, mild during the day and a bit cold at night, alternating with periods of bad weather and rain; from December to February, every now and then, cold air masses from the north can arrive here and cause snowfalls, especially in the western suburbs of the city, which are located at a slightly higher altitude, around 1,000 meters (3,300 feet), and the temperature at night can drop a few degrees below freezing (0 °C or 32 °F). Summer in Amman is hot and sunny, but the altitude tempers the heat; in fact, highs are usually around 32/33 °C (90/91 °F), even though there can also be scorching days, with peaks of 37/40 °C (99/104 °F) from May to September, and more likely in July and August. Amman is located in the north-west, the part of the country that in winter can receive rainfall; here, precipitation amounts to 245 mm (9.5 in) per year, with a maximum of 60/65 mm (2.4/2.6 in) per month in January and February, while basically it never rains from May to October. Here is the average precipitation. The sun in Amman often shines even in winter, except for the periods of bad weather, while in the long dry season, the sky is normally clear. Here are the average sunshine hours per day. Irbid, in the extreme north-west, is even more rainy than Amman; in fact, precipitation reaches 450 mm (17.5 in) per year, but the pattern is the same, with a maximum in winter and a dry summer. Irbid is located at 600 meters (2,000 feet) above sea level, so it is slightly warmer than Amman. As mentioned, in the north-east of the country, the climate is desert; winter temperatures are similar to those of Amman, with possible night frosts, while summer is hotter, and despite the altitude, daytime temperatures around 38 °C (100 °F) are normal, with peaks of 45 °C (113 °F). Here are the average temperatures of Ruwaished, located in the north-east, at 700 meters (2,300 feet) above sea level. Rainfall does not even reach 100 millimeters (4 inches) per year, and it's therefore rare and sporadic even in winter. Here is the average rainfall. In the desert too, the sun shines all year round, but especially in summer. 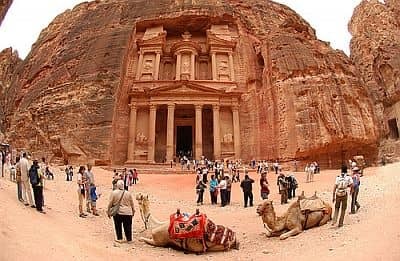 The famous archaeological site of Petra is located in the south, at 900 meters (3,000 feet) above sea level, and it has a desert climate as well. Its temperatures are similar to those of Amman. Here too, in winter the temperature can drop below freezing, while in summer, it can reach 40 °C (104 °F). In Petra too, rainfall does not reach 100 millimeters (4 inches) per year, and it's rare and sporadic even in winter. Here is the average rainfall. In Petra too, the sun shines all year round, but especially in summer. Owing to the low altitude, the Jordan Valley is very mild in winter and scorchingly hot in summer, but while the rainfall pattern in the north is almost Mediterranean like that of Amman, with rains in the period from November to April which amount to about 300 mm (12 in) per year, going south, it becomes progressively more arid. The climate is desert already in the area of the Dead Sea, the salt lake whose banks are located in a deep depression, 400 meters (1,300 feet) below sea level, and which loses most of its waters on the spot because of the strong evaporation. In the Dead Sea area, just over 100 mm (4 in) of rain fall per year. In the Jordan Valley, the daily average temperature in January is around 15 °C (59 °F), while in July and August, it ranges from 31 °C (88 °F) in the north to 33 °C (91 °F) in the south, as happens in Aqaba, the Red Sea port which is also the only small portion of the Jordan territory overlooking the sea. Here are the average temperatures of Aqaba. In Aqaba, the rains are very rare and do not even reach 50 mm (2 in) per year. Here is the average rainfall. In Aqaba, the sun regularly shines throughout the year, but some cloud banks can occasionally reach the area, even in summer. Near Aqaba, the Red Sea is a bit cool for swimming in winter, while it is pleasantly warm in the summer months. The best times to visit Jordan are spring and autumn, and in particular, the months of April, May (when days can already be hot), and October. For a beach holiday on the Red Sea coast, the best months are April, and from mid-October to mid-November; summer is too hot, in fact, it's not easy to sunbathe when the temperature exceeds 40 °C (104 °F) in the shade. Winter on the coast is very mild and sunny, so it can be pleasant, but the sea is a bit cool, and sometimes, the air temperature can be cool or even cold at night. In winter: in Amman, Petra and the plateau: bring warm clothes, a jacket, a hat, a raincoat or umbrella, a scarf for the wind-borne sand and dust, and hiking shoes. For the Jordan Valley and Aqaba: bring spring/autumn clothes, a jacket and a sweater, an umbrella for the area to the north of the Dead Sea. In summer: in Amman, Petra and the plateau: bring light clothes, a sun hat, a sweatshirt or sweater for evenings outdoors, a desert turban for the wind-borne sand and dust, hiking shoes, and a sleeping bag for outdoor overnight stays. For the Jordan valley and Aqaba: lightweight clothes, and a desert turban. It's better for women to avoid shorts and miniskirts in rural and non-tourist areas.